Breast cancer is the principle cancer among female cancer in Tunisia. It represents 30% of the woman's cancers with about 2200 new cases per year. Early detection remains the primary defense available to patients in preventing the development of life-threatening breast cancer. Mammography is the most effective method to detect breast cancer in its earliest stages, reducing the risk of breast cancer death. Breast cancer is the principle cancer among female cancer in Tunisia. It represents 30% of the woman's cancers with about 2200 new cases per year. Early detection remains the primary defense available to patients in preventing the development of life-threatening breast cancer. Mammography is the most effective method to detect breast cancer in its earliest stages, reducing the risk of breast cancer death.Availability of the Mammography in different regions in Tunisia has a direct effect on the accessibility to the service by women. 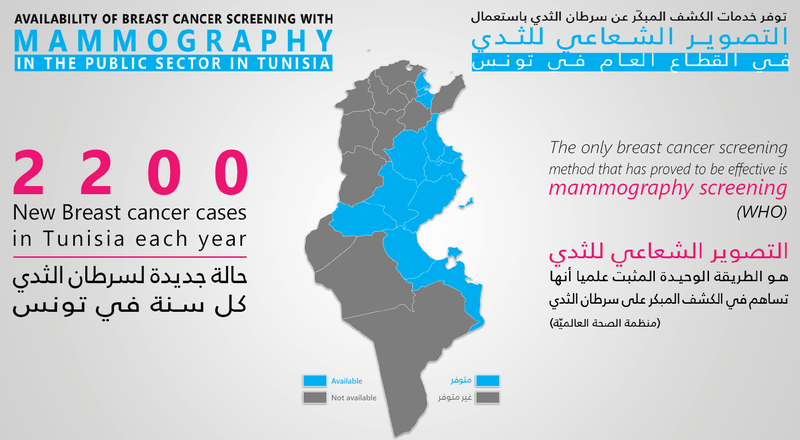 The main goal of this project was to map the availability of the breast cancer screening services using mammography in the public sector in the 24 regions (governorates) of Tunisia. The results are summarized in the above infographic . Screening services using mammography are only available in 11 regions out of 24.